Easy to clean & maintenance-free. Insulated core & reflective backing improve comfort & energy efficiency. Compatible with WaterGuard® perimeter drain tile. Captures all wall seepage and leaks. The ZenWall™ Wall Paneling System is only available from a certified installer in your area. Contact us to request an inspection & get a free cost estimate to have it installed in your home. Core & cover. 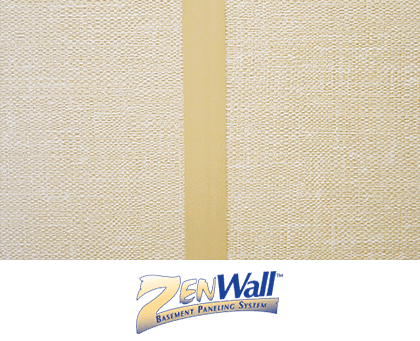 ZenWall™ panels have a core of compressed fiberglass insulation, sandwiched between a tan vinyl facing and a reflective foil backing. Products that do more than one thing provide extra value. 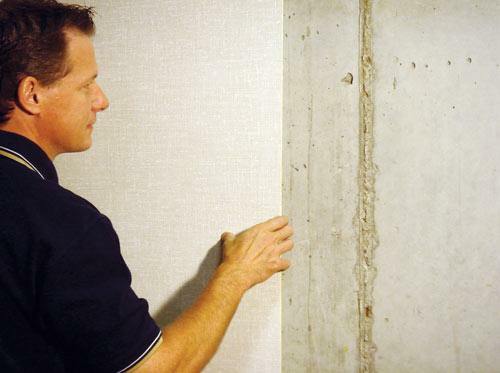 That’s why you’ll be impressed with the ZenWall® Basement Paneling System. ZenWall™ panels can be used throughout the basement, to cover concrete foundation walls and interior partition walls as well. In addition to providing a finished wall surface, ZenWall™ panels also provide moisture and cold protection. 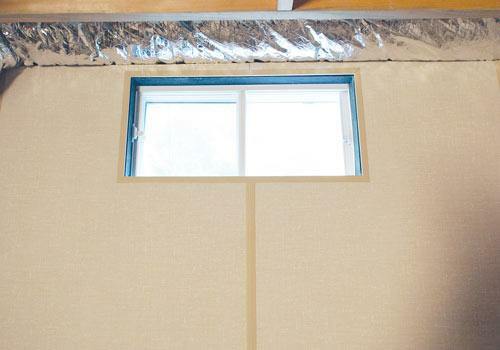 Each ZenWall™ panel has an insulated core and a reflective radiant barrier backing. 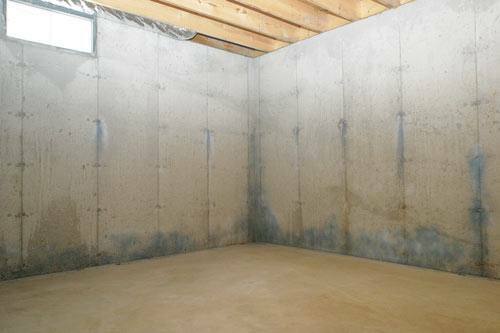 Working together, these features keep your basement more comfortable and eliminate contact with cold, clammy concrete walls. 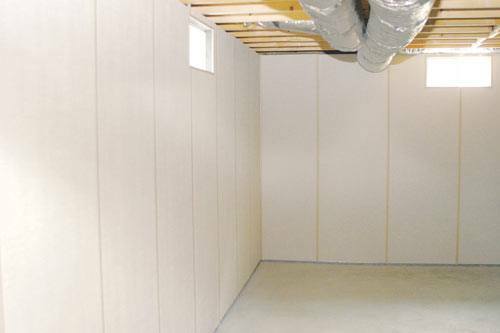 The basement wall panels also direct any wall seepage down to the perimeter drain system, preventing this leakage from getting onto your basement floor. The ZenWall™ panel system includes ¼-in.-thick panels and vinyl molding profiles that are used at all panel joints and terminations. 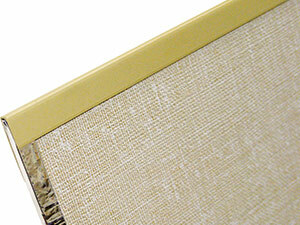 The textured vinyl surface on the “show” side of each panel is attractive, durable and highly resistant to stains. It’s also waterproof and easy to clean with a damp cloth. Most homeowners like the textured surface and the neutral tan color, which is compatible with any décor. 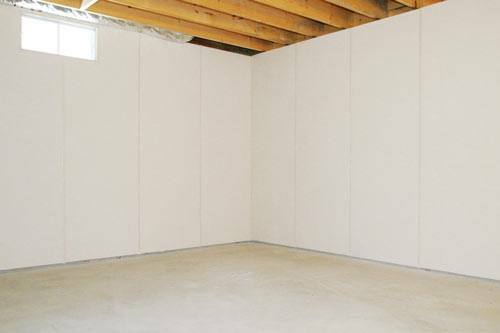 Instead of painting your foundation walls or building wood-frame, gypsum-paneled walls that can be damaged by moisture, why not choose ZenWall™ panels instead? You’ll get a beautiful, maintenance-free wall that will look beautiful for many years.